Mission Hills in Hainan, a Chinese island, already has the world’s largest golf club according to the Guinness World Records. 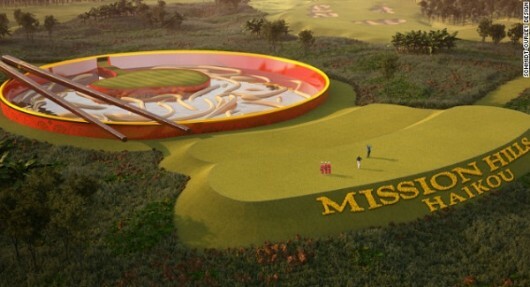 Before long, it will also have perhaps the wackiest full-size golf course in the world. Golf course designer Brian Curley of Schmidt-Curley Design is working on an 18-hole course in Mission Hills Haikou resort that is scheduled for completion in 2014. He intends to make the course like a giant mini-golf experience. One hole will see golfers hitting into a giant bowl of noodles and chopsticks, another will have a replica Great Wall of China, another will resemble Mayan ruins, and one will look like the “Bird’s Nest” Olympic Stadium in Beijing. There will be a par-3 where golfers are hit by hard winds from large fans. One tee shot will be from behind a waterfall, and another will be through a giant sleeve of balls. The golf complex at Mission Hills Haikou covers over 20 sq. km and features 10 18-hole golf courses. Curley believed there was a “sameness” to all the courses, so the idea was to create a course that would appeal to the Chinese public and entice other visitors to come to the island. Despite the gimmicks that will conjure memories of “Caddyshack II,” Curley still wants the course to be taken seriously. Traditionalists might not like it, but it sure sounds like it would be a fun course to play. About the only course that looks like more fun might be this one.